Lobsters are found in great abundance outside the New England coast, and as everything else, lobsters are bigger in America. Last year we ate an 18 lb lobster, said to be as old as me, i.e. 45 years old. This year my cousin Billy Eastman travelled far out at sea to catch two lobsters, each weighing between 10 and 15 lb's, estimated to be around thirty years old. There is not much of a market for these lobsters, and most of them are sold to producers of fresh or frozen lobstermeat. Many believs that the meat is tough, but believe me it is wonderfully tender. Due to my cousin Billy, I am lucky to see, and eat these majestic animals. Ann boiled the two monsters in a huge lobsterpot, and I have to say - it was delicious. What do you serve with New England lobsters? As for all fresh seafood - as little as possible. The lobsters were devoured dipped in melted butter with some corn on the cob or a little salad. When the lobstermeat are cooled down and picked out it is great do mix with some mayonnaise, lemon and finely chopped celery, served in a bun or a baguette. A lobster roll!! This is only one out of many recipes - here is another. 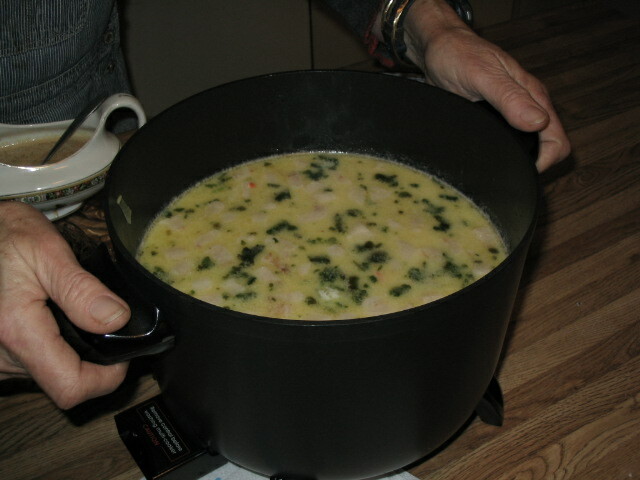 New England Chowder is a fish soup brought over by the settlers. The name of the dish is said to be of french origin and refers to the pot the soup was made in. The chowder itself exists in many varieties, some new and some older. The New England Chowder is usually made with bacon, onions, potatoes, chicken- or fish stock, and cream. The seafood or fish is added at the end of the cooking process. In New England they usually use clams. The Eastman family has their own recipe. It is the luxury edition, substituting clams with lobstermeat. Instead of bacon Ann used salted pork belly and instead of cream - evaporated milk. The latter is said to be somewhat of a secret recipe - not any longer - I'm afraid. The lobstermeat is added just before serving and the soup is served with bread. If you want you can add the traditional cracker crumbs. and by the way - Ann has promised me a recipe. It will be published as soon as it arrives - by e-mail. My family are now dominated by the irish. It is the Bradys of Scituate, and ofcourse Ann's husband Pete from Haverhill MA. His family comes from County Armagh in Northern Ireland. And Corned Beef is said to be as Irish as Irish Stew and Guinness. In Norway corned beef are found in small tins and has the same reputation as Spammeat. I identify corned Beef in that form with my childhood served with fried potatoes and fried egg. Now I think it is out of fashion. I have not seen it in a long time. A pity really, it did not taste that bad. The Real Corned Beef is however serious stuff. The Irish one is very different from the Jewish variety. Isn´t life and culture beautiful? I once watched Rick Stein make Corned Beef with potatoes. The Irish way is with cabbage, I think. Ann prepared the Corned Beef in a Crock Pot, boiling the Corned Beef in a stock for a whole day on a very low heat. She served with Dauphine potatoes. That concludes my memories from New England, until I get the recipes from Anne.